Rashomon was the breakout film not just for director Akira Kurosawa, but for Japanese cinema in general. It was awarded the prize for best film of the year at the Venice Film Festival in 1951, and received the Academy Award for best foreign language film in 1952. I remember watching Rashomon for the first time and seeing it as a kind of “whodunnit.” I thought the different viewpoints were all leading up to some kind of pat conclusion. When it ended ambiguously, I was vaguely unsettled and a little bit angry. Perhaps, since it took place in 11th-century Japan, I was expecting more swordplay. And of course, seeing it on VHS wasn’t an ideal presentation. Flash forward maybe 10 years. Rashomon was playing at Film Forum in New York, so I went to see it. It was like seeing a completely different film. Not only had I grown more comfortable with ambiguity, but seeing a 35mm print on the big screen revealed what a deeply beautiful film Rashomon is. Kurosawa and his cinematographer, Kazuo Miyagawa, shot Rashomon deep in virgin forests in the heat of midsummer. Searing flashes of sunlight wash across the characters, alternating with washes of darkness. Thickets of leaves tremble in the breeze, and look so close you could reach into the screen and touch them. Sweat pools on the actors’ faces, falling from their chins in heavy drops. Rashomon is an uncomfortable meditation on the elusiveness of truth. It exposes the world as a kind of hell, because human beings cannot even be honest with themselves. But it is also a deeply sensuous experience, and an utterly beautiful film. 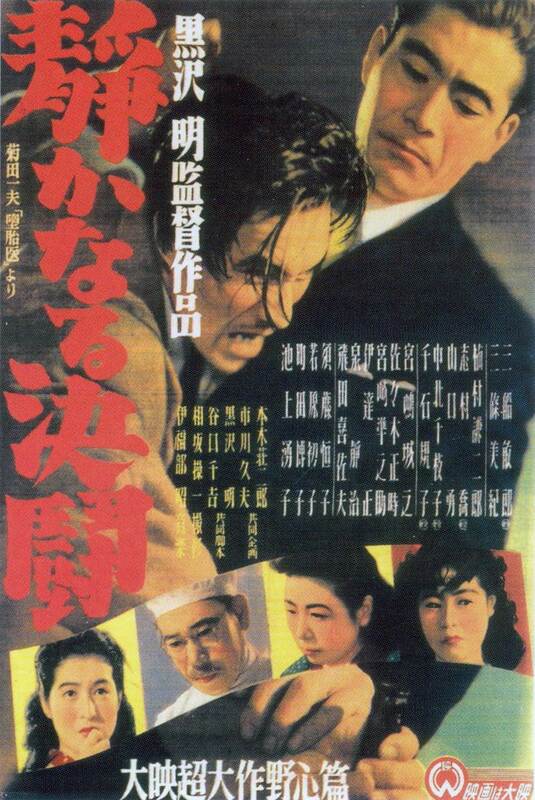 Posted in 1950, August 1950 and tagged 24th Academy Awards, Akira Kurosawa, Daiei Film, Japanese Cinema, Kazuo Miyagawa, Machiko Kyô, Masayuki Mori, Noriko Honma, Takashi Shimura, Toshirô Mifune. Bookmark the permalink. Akira Kurosawa’s ninth film is one of my personal favorites. I love a good police procedural, and Stray Dog is one of the best. I think it’s good for artists to be their own harshest critics, but in this case I think the public is right. Kurosawa may have failed to make the film he wanted, but he succeeded in making a great film nevertheless. 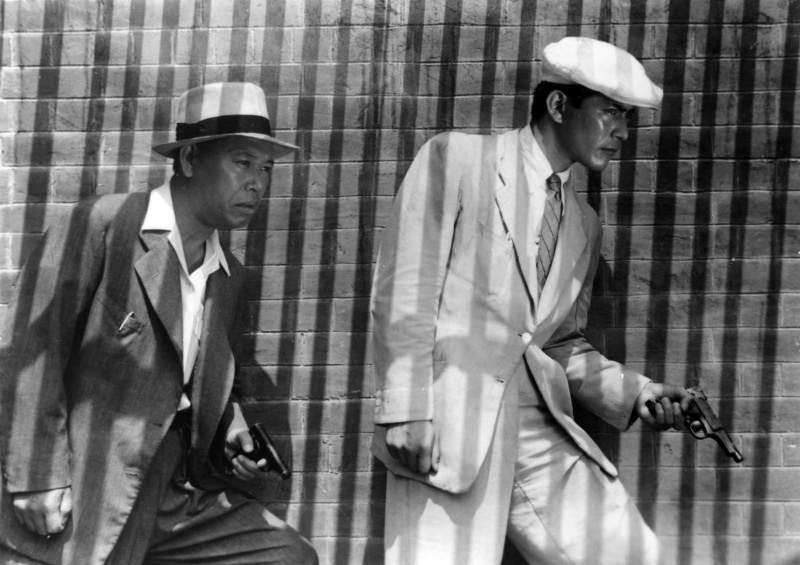 For my money, Stray Dog and Drunken Angel (1948) are Kurosawa’s two earliest masterpieces. Like The Naked City (1948), which was one of the first police procedural movies, Stray Dog pairs an older, seasoned detective with a younger, inexperienced detective. 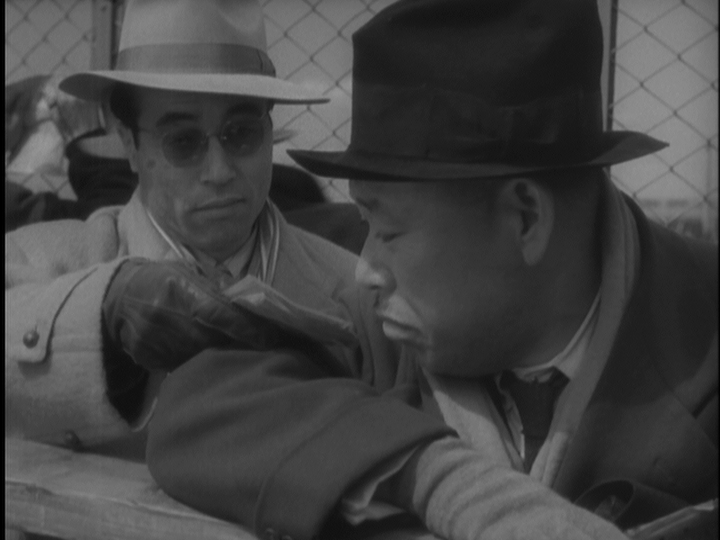 They’re played by Kurosawa regulars Takashi Shimura and Toshirô Mifune. 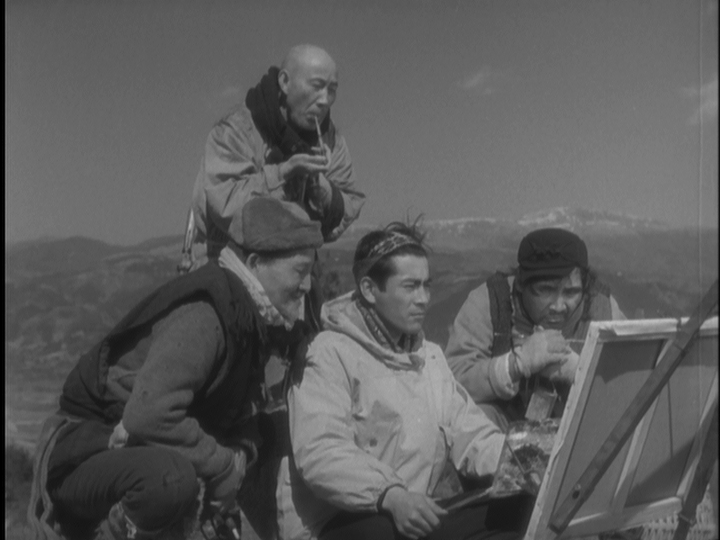 If you’ve seen Seven Samurai (1954), you know Shimura as the de facto leader of the samurai (he’s the one with the shaved head) and you know Mifune as the wild and unpredictable odd man out. 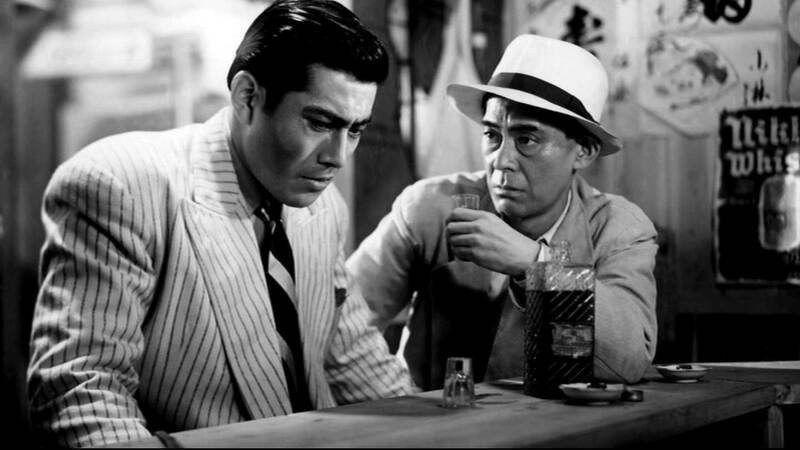 Shimura and Mifune played variations on this relationship in numerous Kurosawa films. In Drunken Angel Shimura was an alcoholic physician who struggled to convince the swaggering young gangster played by Mifune that he had to treat his tuberculosis. 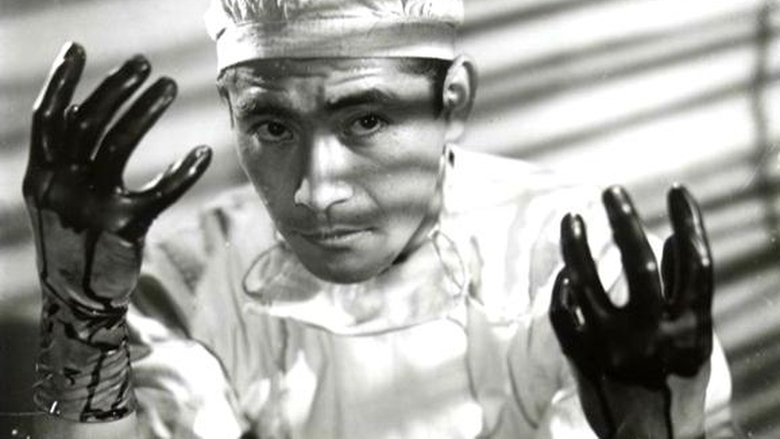 In The Quiet Duel (1949), Mifune played a young surgeon desperate to keep his syphilis infection a secret, and Shimura played his father and the head of their medical practice. 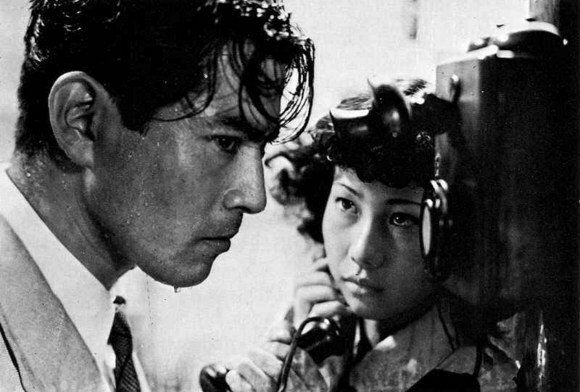 In Stray Dog, Shimura plays Detective Sato and Mifune plays Detective Murakami. Their relationship has elements from their previous two collaborations with Kurosawa, but there’s a playfulness and sense of humor that was absent from both Drunken Angel and The Quiet Duel. The film begins when Murakami’s service weapon is stolen, and Murakami’s shame is more than he can bear. The little .25 caliber Colt Model 1908 Vest Pocket was lifted by a pickpocket on a crowded bus. Its magazine was loaded with all seven rounds. After the weapon is used in a mugging, Murakami writes a resignation letter, but his lieutenant rips up the letter and advises him that catching the thief would be a better form of penance. Stray Dog presents a panoramic view of postwar Japan. Unlike the huge cesspool in Drunken Angel that functioned as a grim and fairly obvious metaphor for life during the American occupation, Stray Dog presents a world that has changed forever, in ways both good and bad. After Murakami makes a positive identification of a female suspect, another detective who is familiar with the woman is surprised to learn that she was wearing a dress, since she always wore a kimono in the past. Murakami assures the older detective that she was wearing a Western-style dress, and that she had a perm and stank of perfume. The older detective shakes his head and observes that times have certainly changed. When Murakami goes undercover to track the passage of the stolen pistol through the black market, we see one destitute person after another in a series of dissolves. Life is not easy for most people after the war. But there’s also the sense of life returning to normal. Sato and Murakami track a suspect to a baseball game and keep him under observation in the stands. This tense sequence features seamlessly integrated 16mm footage of an actual game between the Nankai Hawks and the Yomiuri Giants. The players all have numbers on their uniforms, which was forbidden as “too individualistic” during World War II. I think that Stray Dog presents a more realistic view of police psychology than The Naked City. After Murakami and Sato narrow down their search to a single suspect, Murakami feels sympathy for the man. Like Murakami, the criminal is also a returning serviceman, and Murakami thinks that he could have easily become a criminal if he hadn’t become a cop. As his stolen Colt is used in a series of increasingly brutal crimes, he feels responsible for each one. Sato tells him to leave the psychoanalysis to detective novels and just focus on arresting the bad guys. Sato says that Murakami will never forget his first arrest, but after each subsequent collar he will grow less and less sentimental. Sato has a much lighter touch than Murakami. When we first see him, he is laughing and sharing popsicles with the female suspect who Murakami got nothing from after leaning on her too hard. Sato’s way with suspects appears more lenient than Murakami’s, but it’s because he has a much better idea of what he’s doing. Murakami is dogged but fairly incompetent in the early stretches of the film, but as he learns from Sato he becomes more patient and observant. A young person learning from a seasoned veteran is one of the oldest stories in the book, but it’s a damned good one when told well, and Kurosawa told stories extremely well. In addition to the convincing performances and the involving story, Stray Dog is a triumph of atmosphere. The film takes place in the hottest days of summer, and Kurosawa never lets the viewer forget it. The opening shot is a closeup of a dog lying on the ground and panting. The first words we hear from the narrator are, “It was an unbearably hot day.” In nearly ever scene there is something that conveys the humidity and languor — people fanning themselves, sweat glistening on faces and staining clothing, men mopping themselves with handkerchiefs and rolling up their sleeves. When a chorus of scantily clad showgirls led by the beautiful and petulant Harumi Namaki (Keiko Awaji) traipse off stage and collapse on the floor, their flesh is beaded with perspiration. Fumio Hayasaka’s score conveys tension and excitement, but it’s used judiciously. Kurosawa also makes great use of diegetic music in the film’s two climactic scenes. In the first, the heat has finally broken and there is a tremendous rainstorm as the radio in a hotel lobby plays Sebastián Yradier’s “La Paloma” in the background. In the second climactic scene, Murakami confronts his quarry behind a house where a young woman is playing Friedrich Kuhlau’s Sonatina in C Major, Op. 20 No. 1. The music tinkles out of an open window, its serenity at odds with the violent confrontation that is about to explode. Stray Dog is one of the best police procedurals of all time, but like a lot of great films it transcends its own genre to tell a universal story. Starting in 1950 with Rashômon, Kurosawa would gain more and more attention worldwide as he produced one great film after another. 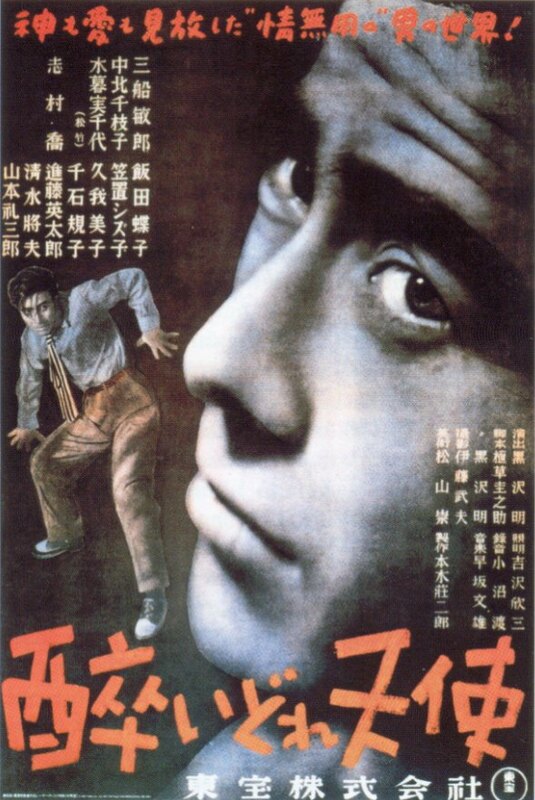 Stray Dog was one of the last films Kurosawa made that was pretty much unknown outside of Japan until the 1960s. It’s still not as widely seen as his best-known films, so if you like Japanese cinema and haven’t seen it yet, you have something to look forward to. 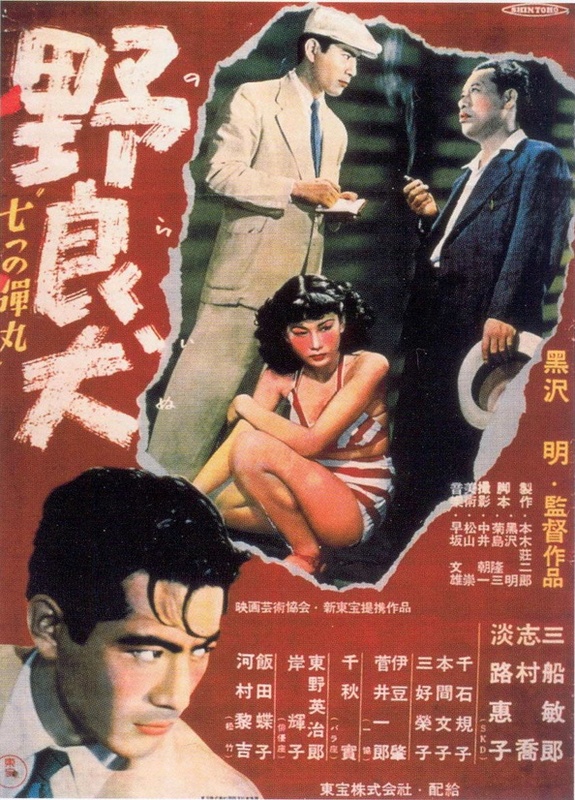 Posted in 1949, October 1949 and tagged Akira Kurosawa, 野良犬, Film Noir, Foreign Films, Fumio Hayasaka, Japanese Cinema, Keiko Awaji, Police Procedurals, Ryuzo Kikushima, Takashi Shimura, Toshirô Mifune. Bookmark the permalink. Like a lot of people, I was introduced to Japanese cinema through the films of Akira Kurosawa. I was 11 years old, and my mother took me to see Ran (1985) at our local art house theater. Not long after, we saw Seven Samurai (1954) on the big screen. I was hooked, and saw Rashomon (1950), Throne of Blood (1957), Yojimbo (1961), and Dreams (1990) before I graduated high school. 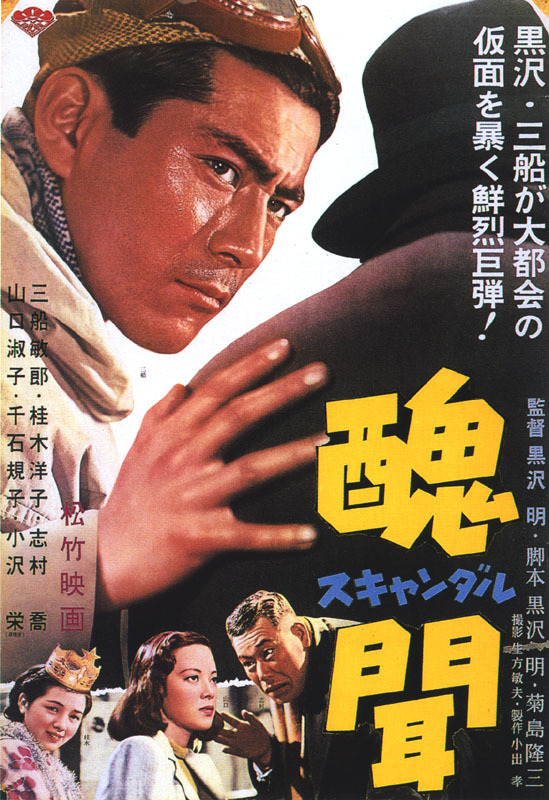 I also watched Hiroshi Inagaki’s trilogy of films about Musashi Miyamoto (1954-1956) that starred Toshiro Mifune. At some point in my early adulthood, I realized that there was more to Japanese cinema than samurai and swordplay. Kurosawa himself made brilliant human dramas like Ikiru (1952) and contemporary police dramas like High and Low (1963), and he was just one director among many. It’s become a cliche to say that Kurosawa was the “most Western” of Japanese filmmakers and that Yasujiro Ozu was the “most Japanese” of Japanese filmmakers, but there’s plenty of truth in it. Kurosawa drew inspiration from American westerns and French detective novels, while Ozu depicted Japanese family life without any fireworks or flashiness. 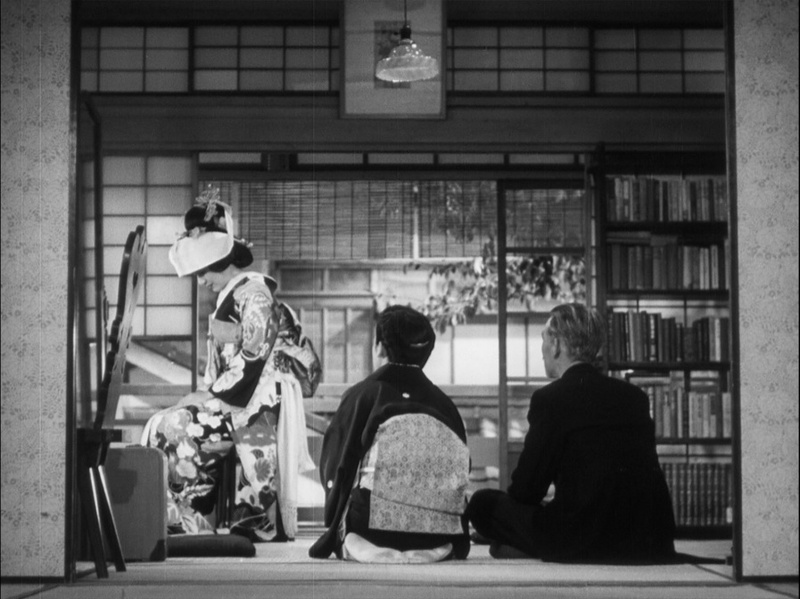 One of the most commonly mentioned aspects of Ozu’s directorial style is that he shot most of his interiors with a camera placed about three feet above the floor, which is the point of view of a person sitting on a tatami mat at home. Ozu framed his shots unpretentiously, and made the viewer of his films an unseen but unremarkable presence in the lives of his characters. Ozu began making films in the silent era. By the time he directed Late Spring, he’d made close to 40 movies. Late Spring is based on Kazuo Hirotsu’s short novel Father and Daughter. Ozu wrote the screenplay with his frequent writing partner Kogo Noda. 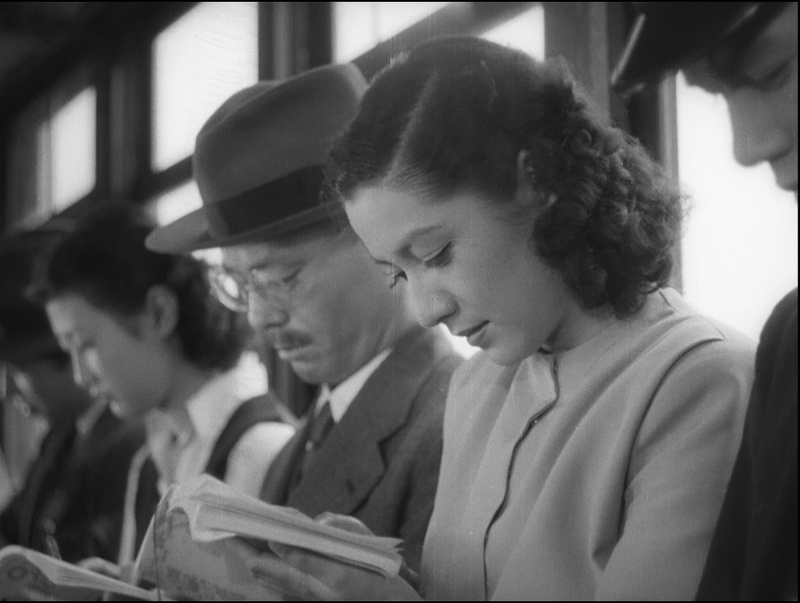 The luminous actress Setsuko Hara, whom I last saw in the early Kurosawa film No Regrets for Our Youth (1946), plays Noriko Somiya, a 27-year-old who still lives at home with her father. Her father, Shukichi Somiya, is played by Chishu Ryu. Both Setsuko Hara and Chishu Ryu appeared in many of Ozu’s films. Ryu worked with Ozu 33 times and Hara appeared in six of his films. Noriko has a sunny disposition and is devoted to her father. She is charming, and gets along with everyone, but sees no reason why she should marry and leave her aging father to fend for himself (although she does seem to have romantic feelings for her father’s assistant, Shoichi Hattori, who is played by Jun Usami). Her father desires to marry her off, but he is ambivalent. He loves her and doesn’t want to let her go, but children must marry and leave home. It is simply the way of the world. On one level, Late Spring is a simple story of normal people living in a specific place and time, but on another level it is a timeless and universal story about change, aging, regret, and loneliness. Unlike most American films, there are no solutions to anyone’s problems. No one is completely right or completely wrong. Late Spring isn’t a cri de coeur against the patriarchy, but it’s not a celebration of it either. The final reel of the film doesn’t feel calamitous or momentous, until the final minute, which is one of the most quietly devastating endings to a film I have ever seen. 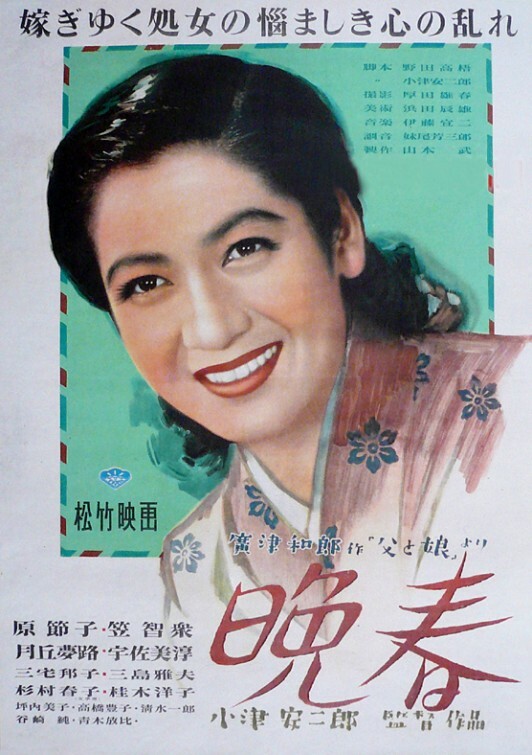 After Late Spring, Setsuko Hara appeared in five more of Ozu’s postwar films. In her next two films for Ozu she also played a character named Noriko — Early Summer (1951) and Tokyo Story (1953) — and Chishu Ryu again played her father in both films. They weren’t meant to be exactly the same characters from film to film, but they were all thematically linked. Unlike the filthy cesspool Kurosawa depicted in his postwar film Drunken Angel (1948), Ozu’s critique of the American occupation of Japan in Late Spring is much more subtle. 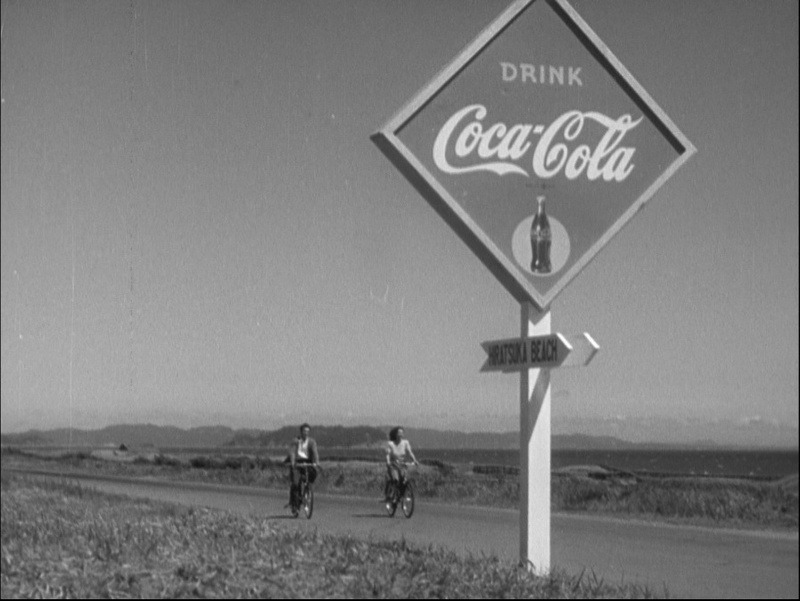 But in typical Ozu fashion it’s haunting despite its simplicity. Was he the first filmmaker to use the ubiquitous Coca-Cola symbol to represent American military and social power? If he wasn’t, its use in Late Spring is the first I’ve seen. Late Spring is a brilliant film. It’s only the second Ozu film I’ve seen (the first was Tokyo Story), but I’m looking forward to seeing many more. On a personal note, I’ve written this entire review with my four-month-old daughter asleep in a baby carrier on my chest. I have no idea what the future will bring, but someday I will have to let her go. It’s a prospect both wonderful and terrifying. Posted in 1949, September 1949 and tagged Chishu Ryu, Japanese Cinema, Jun Usami, Kazuo Hirotsu, Kogo Noda, Setsuko Hara, Shochiku Eiga, Yasujiro Ozu, Yumeji Tsukioka, 晩春. Bookmark the permalink. The Quiet Duel is not one of director Akira Kurosawa’s major works. Most reviewers treat it as a lamentable, melodramatic footnote in his career, but I don’t think that’s fair. 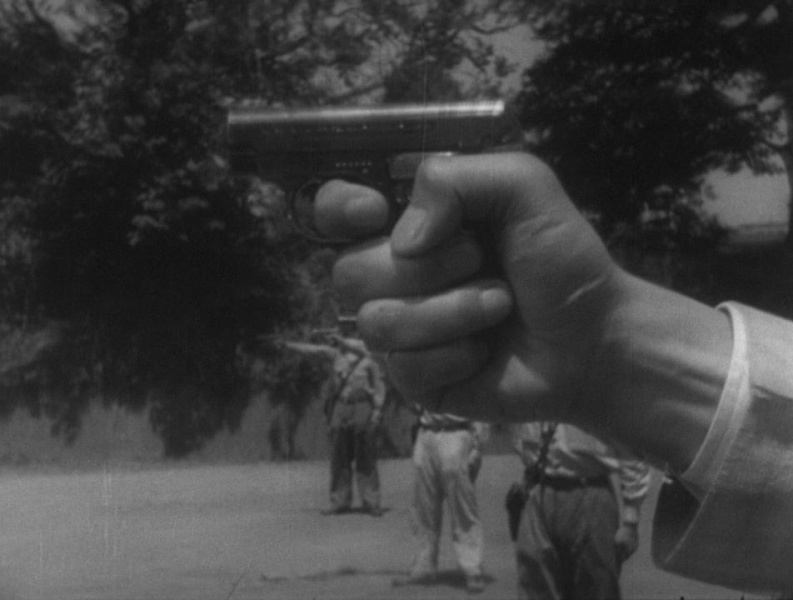 Unlike No Regrets for Our Youth (1946), which I think all but the most dedicated Kurosawa completists can skip, The Quiet Duel is worth seeing at least once if you’re a Kurosawa fan. It also functions as a thematic bridge between two of Kurosawa’s major early works, Drunken Angel (1948) and Stray Dog (1949). Like both of those films, The Quiet Duel pairs two of the director’s most dependable stars: Toshirô Mifune and Takashi Shimura. It shares with Drunken Angel the theme of a doctor who struggles with his own conscience, and it presages the major theme of Stray Dog — two young men who face the same difficult circumstances but who make very different ethical decisions. Mifune and Shimura are always interesting to watch when they’re on screen together, and if The Quiet Duel is their least interesting pairing in Kurosawa’s body of work, it’s only because most of their appearances together for Kurosawa were in films that are all-time classics. The Quiet Duel (or The Silent Duel, as it’s also translated), is based on a play by Kazuo Kikuta. 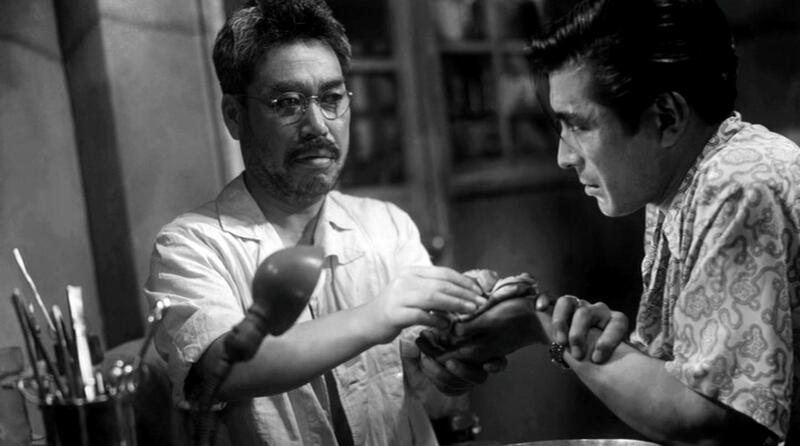 Mifune plays Dr. Kyoji Fujisaki, a young physician who contracts syphilis when he cuts himself while performing surgery in a field hospital during World War II. After the war, he returns to work with his father, Dr. Konosuke Fujisaki (Shimura). Kyoji rejects his fiancée, Misao (played by Miki Sanjō), without an explanation. He treats himself with Salvarsan in total secrecy. (Salvarsan is the trade name for arsphenamine, the first effective treatment for syphilis.) And he struggles with his sexual desire and romantic longing, both of which he completely stifles so he won’t infect anyone else with his malady. Later in the film, he again crosses paths with the man he operated on during the war. Unlike Kyoji, this man treats his syphilis as a trifling matter, and doesn’t care who else he infects (his wife is pregnant). We’ll see this moral theme again in Kurosawa’s next film, Stray Dog (1949), in which Mifune plays a young police detective whose gun is stolen. The “stray dog” of the title is a young man who suffered the same indignities and deprivations as Mifune following the war. Unlike Mifune, he chose to take his pain out on the world, and goes on a crime spree with Mifune’s gun. Most of The Quiet Duel is pretty stagey, and the story is melodramatic. But when Mifune finally lets loose, he lets loose as only he could, and it’s something to behold. And while the film isn’t a great showcase for Kurosawa’s directorial talents, there are a few scenes — especially the surgery sequence that opens the film — that rank among the best work he did. Posted in 1949, March 1949 and tagged Akira Kurosawa, Daiei Studios, 静かなる決闘, Foreign Films, Japanese Cinema, Kazuo Kikuta, Miki Sanjō, Takashi Shimura, Toshirô Mifune. Bookmark the permalink.